Everything that is created, requires maintenance so that it can perform at its optimum level. Maintenance is an integral part of any construction. It can be building construction, equipment manufacture, electrical operation or software development. Without proper maintenance, any system is bound to break down sooner than later. Therefore, to maintain a system or a product, a maintenance manual is of ultimate importance to help people out in troubleshooting and general improvement. 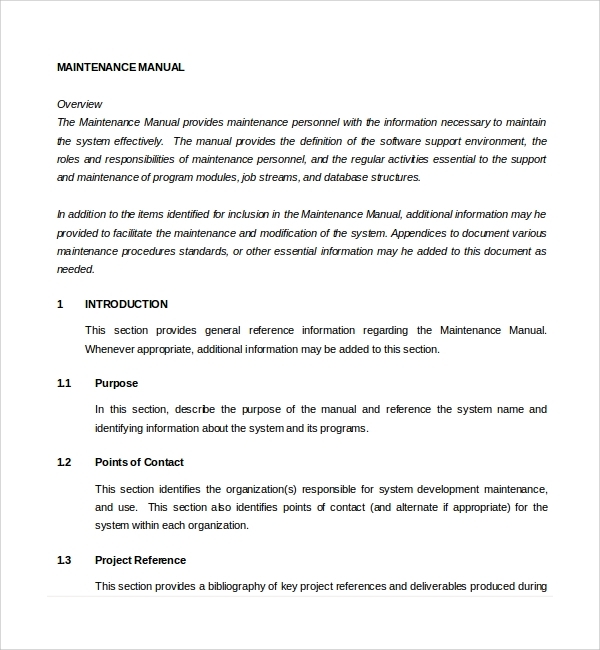 The maintenance manual template, Project Manual Template provides you the structure to write the procedure in the most illustrative and lucid way. 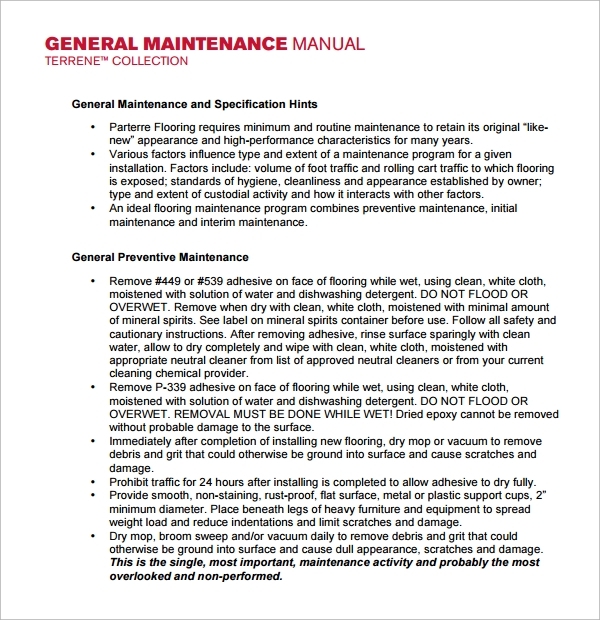 A building maintenance manual template generally consists of different sections such as emergency procedure which deals with probable emergency situations and outlines the steps like what to do in such circumstances. It also has a drawing of the building for easy accessing and understanding, legal information, operating instructions and guidelines for regular maintenance. 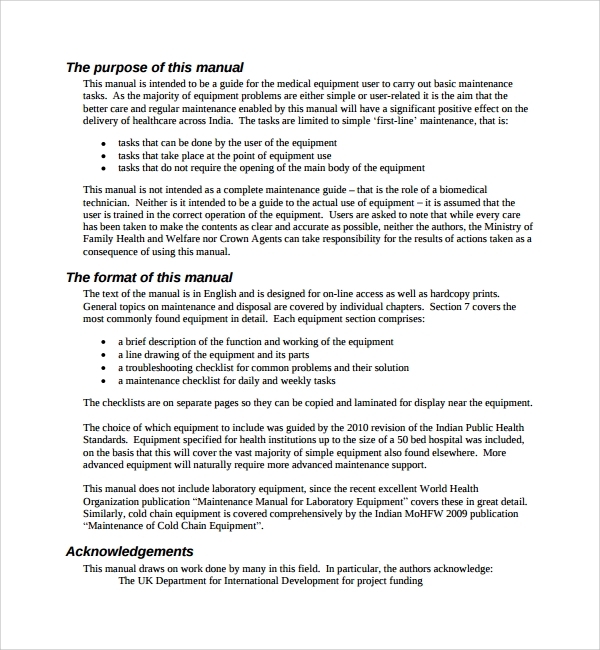 An equipment maintenance manual template consists of the technical requirements for operating the equipment, procedure for installation, troubleshooting problems and FAQs. Besides, it provides a thorough step-by- step procedure to maintain the equipment so that equipment does not yield abnormal results. Besides, it also states functional usage, preventive and corrective measures along with parts listing. 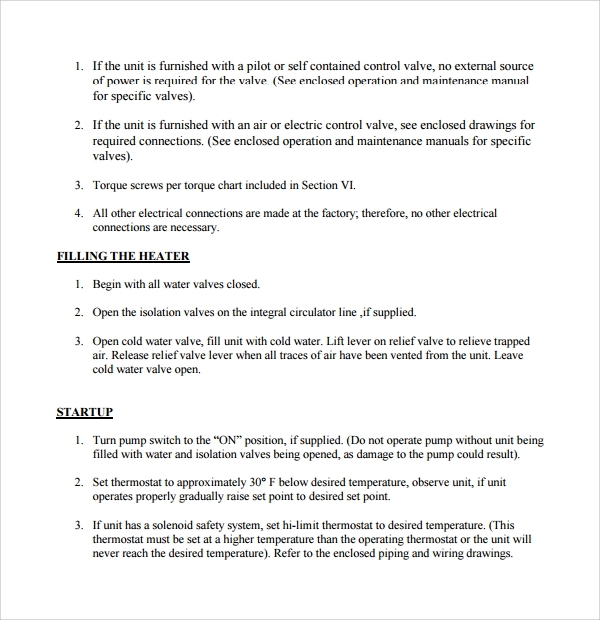 An electrical operation and maintenance manual template essentially consists of how to operate the device and its preventive measures so that no mishap occurs. It outlines all the effective steps to get an efficient result from the machine or system. It has almost all the common problems with their solutions. Parts listing and their usage and replacement are important information are always there at your disposal. A software maintenance manual template provides you all the information and guidelines to operate the software in the most effective way. It also provides tips and tricks to outperform peers. It consists of troubleshooting guidelines and maintenance tips to let it perform at its optimal level. It also states the hardware requirements and flow charts to explain its working. 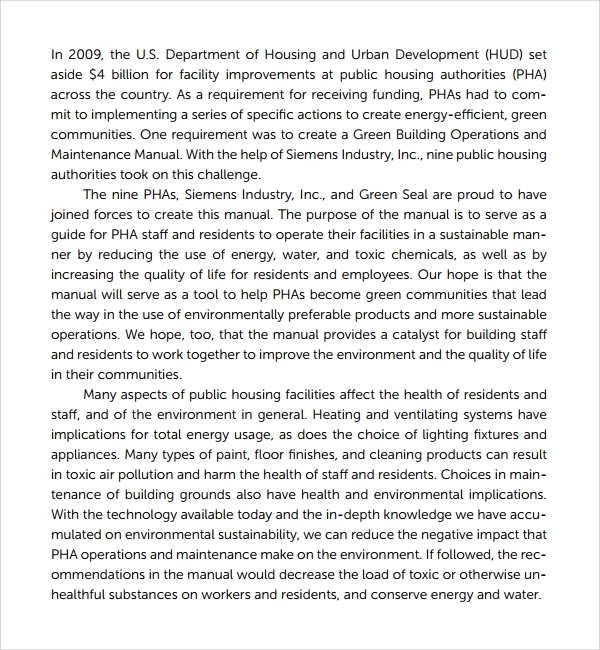 Maintenance manuals have always been an essential part of any product or device. You cannot sell anything without stating how to maintain it. Written documents help the buyers and the users to use them easily. Furthermore, along with operational guidelines, troubleshooting tips are equally important as no system is perfect. Besides, every system requires some maintenance after a certain period of usage. Don’t let your buyer panic and curse you for not providing maintenance manual or in other words, your buyer will come back to you because the maintenance manual has prolonged the product’s lifetime and they will buy their future products from you only. 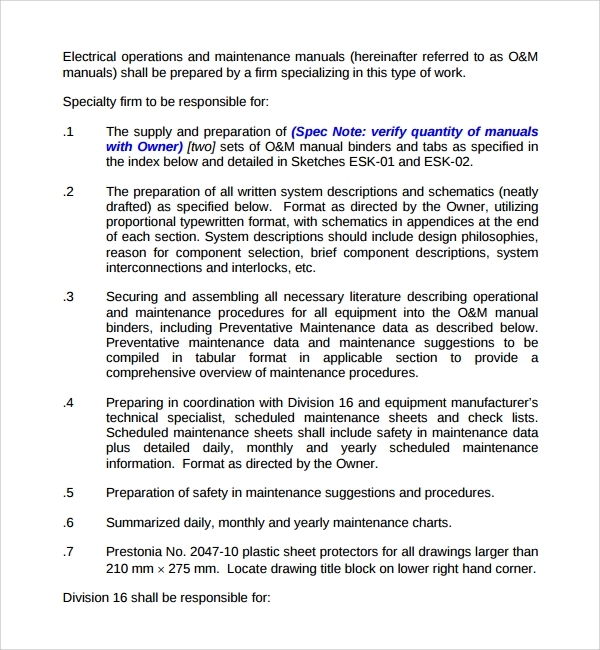 A maintenance manual template can provide you all the ingredients required and how to do the maintenance in an organized and structured way. All you need to do is add the content in appropriate places. Besides, in those templates, you have sections where you can add images and illustrations to demonstrate a complex process so that the user will understand it quickly. If you are a startup, you don’t have to panic to match the standard of the existing competitors when it comes to manuals because they also use a similar maintenance manual template, Staff Manual Template as they are professional and followed everywhere in the industry in which you are stepping for the first time. Ideally, a maintenance manual must give a brief description about the usage of different parts with diagrams. Different parts require different maintenance steps so after stating the use of every part of the product, you must immediately state how to maintain them with illustration whenever required. You must clearly mention the list of ingredients required at once so that the user can buy them at once. It should mention the time period after which one should go for servicing. The Technical Manual Template procedure must be stated in step by step process and in details as the users may not be professionals and may find it difficult if things are not explained clearly. 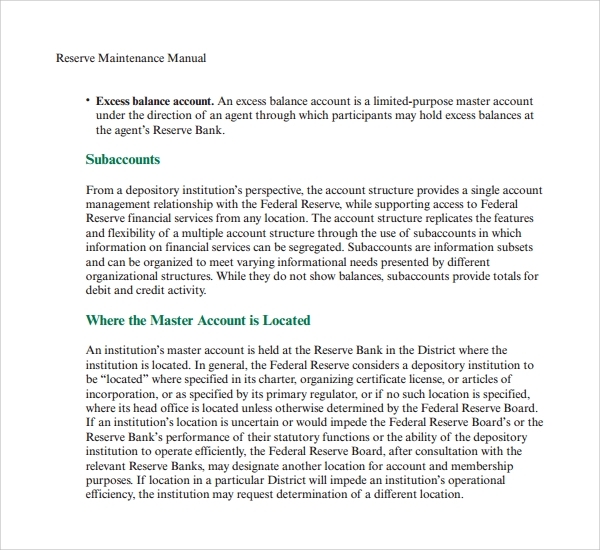 Maintenance manual template is absolutely indispensable. Every device needs maintenance and good maintenance can only be done when you have structured manual where guidelines are in an organized flow. 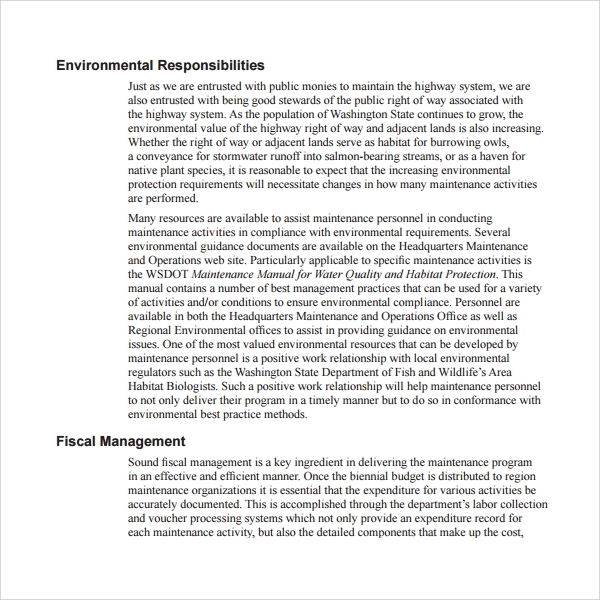 That is why ready-made maintenance manual template can make this your job quick and easy with effective productivity.